G8 leaders are likely to announce new measures that will make companies more transparent when it comes to taxation. G8 LEADERS HAVE have declared they will “fight the scourge of tax evasion” and have committed to changing their tax rules if companies shift profits across borders to avoid taxes. In a joint communique issued this afternoon, the Lough Erne Declaration commits the leaders of the US, UK, Russia, France, Germany, Italy, Japan, Canada and the EU to greater transparency when it comes to taxation. They also committed to ensuring extractive companies are more transparent in their mining and drilling of natural resources, and said that protectionism should be “rolled back”. Leaders also declared that “wasteful bureaucracy” should be cut at borders to allow easier movement of goods. This so-called register of beneficial ownership does not appear in the final document and instead leaders commit to making sure that “companies should know who really owns them and tax collectors and law enforcers should be able to obtain this information easily”. The UK has used its presidency of the G8 to advance its tax agenda – one of the three Ts (the others being transparency and trade) – and had been attempting to update taxation rules that have not been scrutinised in decades. Chancellor George Osborne said this morning that a register of beneficial ownership will make clear what kind arrangements multinationals benefit from but it appears that this will not set up on an international basis. Speaking at a briefing earlier today economics professor Paul Collier, an informal advisor to British Prime Minister David Cameron, said that ideally information should be “readily accessible’ to tax authorities to allow them to assess how much corporations should pay. Michael Anderson, Cameron’s envoy on UN development goals, said that the the UK “strongly recognises” the need to move “to a global unified system of automatic exchange of information”. Anderson also said that recent controversies surrounding Ireland’s tax regime, and criticism in the US of corporations like Apple having effective tax rates of as low as two per cent because of their use of the Irish tax regime, have not been discussed. “We haven’t discussed it in the context of the G8,” he said. G8 leaders also look likely to commit to work with the OECD which outlined in a report today how to bring about automatic sharing of financial information, considered the key weapon in the fight against banking secrecy. The report suggests that countries adopt broad, standardised legislation so that bilateral information-sharing agreements can be quickly and easily negotiated. 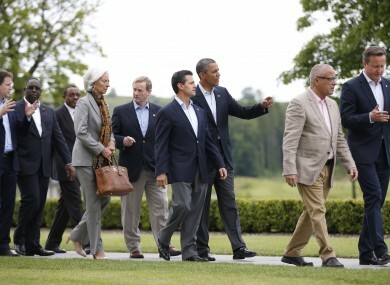 Email “G8 leaders agree to ‘fight the scourge of tax evasion’, Ireland’s regime not discussed”. Feedback on “G8 leaders agree to ‘fight the scourge of tax evasion’, Ireland’s regime not discussed”.